I feel like I have become somewhat of a potty expert and yet Lara has barely started to potty train! I've learned that Lara much prefers to sit on a big potty than a compact one and that the brighter the colour, the more interested she seems. Over the past couple of weeks we have been trying out the Pourty Potty with some success. The Pourty Potty is a potty that pours. Simple! It is a really nice big potty so Lara actively looks to sit on it. Our Pourty is a gorgeous dark purple colour (Lara's favourite) but it does come in a range of bright colours for different little people tastes. 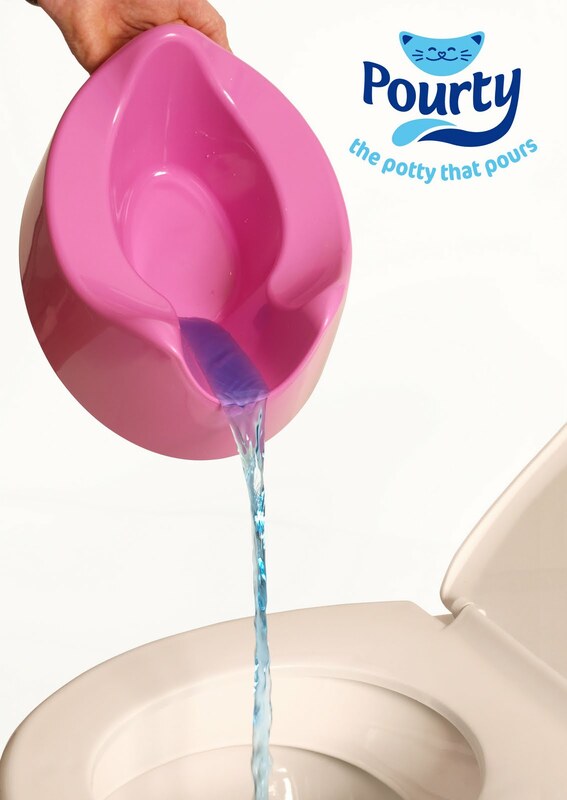 The Pourty is shaped at both the front and the back of the potty to encourage a good sitting position. I believe that it is designed so that your child can sit on it in either direction which is handy, because Lara refuses to sit on it the traditional way around! At (what I would consider to be) the back there is a channel and a gap out of which you can pour the contents of the potty after use. At first, I wasn't convinced that this was enough of a selling point for me but now I have used it a few times I certainly appreciate it. If you tip the contents of a potty down the toilet there is the inevitable splosh, perhaps even a splash which you would rather avoid. The concept of the Pourty potty is so simple that it baffled my husband the first time he used it. How could it be this easy? !!! There is a good sized hole at the front to make it easy to carry the potty and ensure you don't need to grasp the edge of the potty itself when emptying it out. It has really noticeably high sides which I'm told help to prevent splashing and is shaped to make it comfortable for both buys and girls to sit on. The Pourty certainly does make life a bit more simple for parents. The Pourty is the largest that we now own (I think we're approaching one per room now) but it is Laras favourite and to me, that is the most important thing. We keep it in her room by her bed and she can use it when she gets dressed or un-dressed. She often reads herself a bedtime story while sitting on it! The bulk of the potty would put me off taking the Pourty out with us when we are away from home. The Pourty is available from most good nursery retailers. Could I Really Be A Bronze Goddess? Did You Talk To Your Baby?